Augmented Reality may not be super practical yet. But it sure is cool, and a lot of fun. And a new Android game looks to make it even more fun. Space InvadAR is a new Android game by Zenitum. It’s the world’s first “vision-based” AR game, according to the team. And it looks awesome — watch the video below. Basically, you load the game and aim your device’s camera at a printed out target image (which you can get on the game’s website). 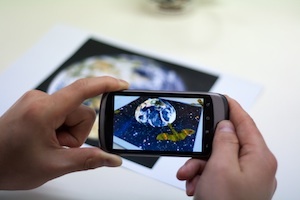 Once you do this, the image (in this first case, a planet) comes alive on your screen. And then aliens begin to show up and you kill them. It looks awesome. Now for the downsides: first, the game is $25 in the Android Market. Second, it only works on the Nexus One or HTC Desire. Third, it’s impossible to win the game. So it may be more of a really cool demo then anything else right now, but again, just watch the video.